Enjoy being just minutes away from the Lutsen Ski Resort and Superior National at Lutsen Golf Course. Make Cedar Allee your home away from home on Lake Superior`s North Shore. The view you will be greeted with when you pull into the driveway of this uniquely designed home. Large picture windows allow you to enjoy the views of Lake Superior from the master bedroom, kitchen, and living room. Your private patio space is a great place to sit back, relax, and enjoy the views of Lake Superior. The cozy and comfortable living room features a gas burning fireplace and, of course, amazing Lake Superior views. Enjoy the open living area in Cedar Allee. Enough seating for the whole family to enjoy a meal together around the dining table. The fully remodeled, modern kitchen is a great place to prepare a meal during your stay. The master bedroom features a queen sized bed. With its large windows and private sitting area the master bedroom is simple but beautiful. The first guest bedroom features a full size bed. This room is uncluttered and comfortable. The second guest bedroom features a twin size bed. The split bathroom features a shower and vanity on one side of the bedroom hallway. This side features a vanity and walk-in shower. The other side of the hallway features a vanity and a toilet. The split design allows a guest to use one side while another uses the other. The easy access front entry way and single story layout make Cedar Allee a nice choice for those with mobility issues and small children. The home is surrounded by natural, untouched foliage to enjoy the many wild flowers and animals that live in the area. There is a steep staircase with no hand rails that leads down to a private cobblestone cove beach below. Sit back, relax, and enjoy Lake Superior for as far as the eye can see. A single tree obstructs your view, making for a great Lake Superior view home. With sweeping Lake Superior views, plenty of privacy, and tasteful interior, Cedar Allee is the ideal home to consider your North Shore home away from home. Peace and tranquility are the keywords for this inviting 3-bedroom, 1-bathroom, 1-story cottage, with its full wall of windows for capturing Lake Superior's many moods! A gas stove adds warmth and comfort to the living room while the well appointed, remodeled kitchen allows you to prepare a home-cooked meal. Step outside and enjoy the true wonders of this Lake Superior Home. Lake Superior jets out as far as the eye can see from your private patio area. Enjoy the sounds of the waves crashing against the shoreline while you sit back and star gaze on a clear summer's night. There are no nearby neighbors or light pollution! Just you, your vacation home, Lake Superior, trees, and the stars in the sky. 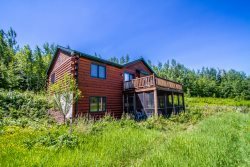 Conveniently located just a few miles from downtown Lutsen and only 5 minutes to Superior National at Lutsen Golf Course and the Lutsen Mountains Ski and Recreation Area. This is the ideal location for your next North Shore adventure! In fact, you are walking distance to cross country ski trails and just a short drive from miles of hiking and mountain biking trails. Don't want to cook at home? You are close to many dining options including the Lakeside Dining Room and Poplar River Pub at Lutsen Resort, Moguls Grille & Tap Room at Caribou Highlands, and Papa Charlie's Restaurant & Tavern at Eagle Ridge Resort, all of which feature live music from popular local musicians throughout the year. Pets are welcome with prior approval and an additional pet fee. 2 pet maximum. Summer 2018 Update: The sauna has been repaired! Split bathroom with shower and vanity sink on one side of hallway with toilet and vanity sink on other side of hallway. WOW! Being so close to the water was a very special experience and treat. Sunrise and moonrise each day were spectacular. When we discover oil we are going to do everything possible to pursuade the present owners to sell! The only thing we lacked was a fly-swatter - However, we are to blame as we left the screen door open a little to long. Our cell phones even worked!!! Incredible view. House was very comfortable. It would have been nice to have another bathroom.